Aunt Sally Good Food: Can you fry chocolate chip cookies? No. However, it didn’t stop me from trying. This is my blog of thrill seeking – cooking without an oven. I’m curious to see where this adventure will lead; what questions will arise. How else can one cook? Can we live without modern conveniences, or are we chained to them? If we deprive ourselves of them, what lessons will we learn? What will we learn about ourselves? Can we fry chocolate chip cookies? 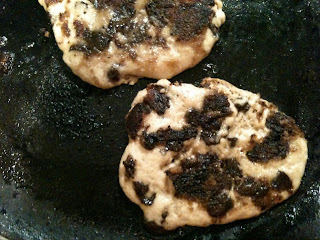 So, not having an oven, yet craving warm cookies, I wondered if they would cook up in an iron skillet. Save yourself the effort of experimenting. The cookies melt and burn before they get done. 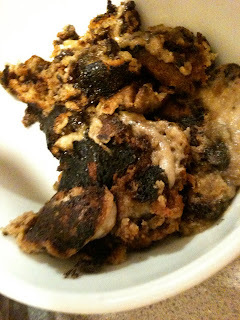 I’ll bet you’re not used to seeing an ugly picture of ugly food on a culinary blog. Life is like that. It’s not always pretty. Life cannot be Photoshopped. No, chocolate chip cookies cannot be fried, but there is a lesson in the experiment. It’s a lesson I hope my niece learns from my example. Don’t be afraid to try. Sometimes the things we think are the sweetest turn bitter and burnt. Learn from these experiences and try again. Sooner or later, something miraculous will occur. This is the lesson I want to teach Alexandra. Maybe this time, I’m the one who needs the lesson. Fried chocolate chips cookies ? Sally, keep practicing and you will make a killing at next year's State Fair ! Thank you for your offer of support. I am new at this but having a great time with it. I still need to learn the ropes. I am sorry I missed the Chaine evening at Milestone as I was out of town with the foie gras people. Let me know what you think of my writings and what if anything I can do for your group in hte blogosphere or otherwise. I have been wanting to try this out myself, thank you for helping me save the trouble, I am wondering tho if maybe you "stiffened" the dough up that it might cook easier? To tell you the truth, I tried this for a laugh. I seriously doubt there is anyway it will work, but if you find a way, please let us know! !